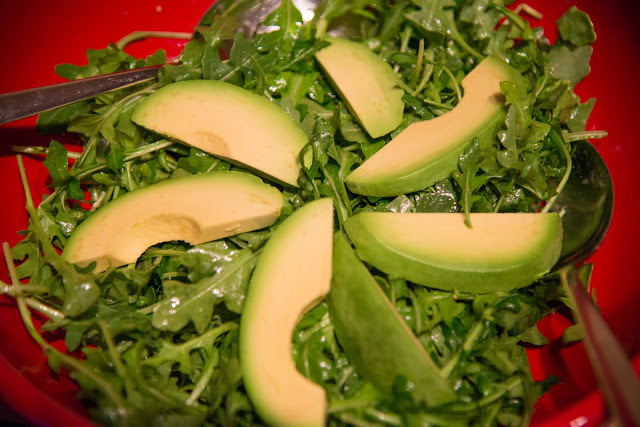 The Visual Science Lab / Kirk Tuck: OT: Arugula and Avocado Salad. With Vinegar and Oil. OT: Arugula and Avocado Salad. With Vinegar and Oil. We just whipped this up on Sunday and I loved the mix of flavors. Served alongside a nice New York Strip. This would be my supper, less the steak. But why do the avocados look like cantaloupe slices? Are Texas avocados different from the ones I buy at Whole Foods in the Mid Atlantic? Perfect dinner for me Kirk. I like Hass.